Rent River Terrace Inn | Corporate Events | Wedding Locations, Event Spaces and Party Venues. An exquisite wedding overlooking the Napa River, our California Wine Country wedding location features 5,400 square feet of elegant indoor and outdoor function space, accommodating up to 300 guests. Celebrate your Napa Valley wedding with style in a dramatic setting with a captivating décor of warm woods, rich leathers and fabrics, and glowing stone hearths. Enjoy unforgettable wedding festivities at our incredible outdoor venues, featuring romantic fire pits, lighted trees and stunning views of the Napa River. Quite literally on the banks of the Napa River nature preserve this pastoral and natural space is a perfectly serene location for a welcome reception, a wine tasting hour before dinner, or a small wine country ceremony or dinner with a view. If you are looking for rustic charm and an escape for the buzz of Napa’s small town happenings this is the perfectly hidden gem of a space that was made for you. The Outdoor Terrace is a unique setting for welcome receptions, cocktail parties, dinners, and day after brunches for up to 50 people. 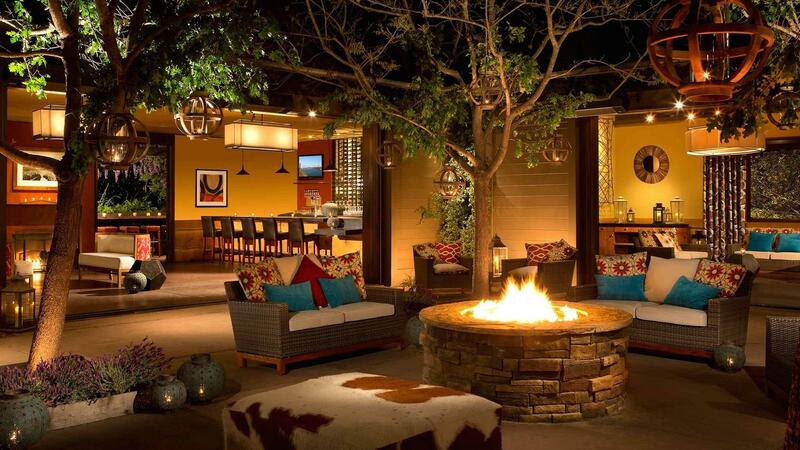 This typically boasts gorgeous views of the Napa River as our outdoor portion of our onsite restaurant Terrace Café, but for your special occasion it is transformed to an intimate outdoor venue with a glowing fire pit and natural teak furniture along a low stone wall. Overlooking the Napa River, the River View Event Garden is a spectacular and sprawling outdoor wedding and event site for 50-300 guests. Perfect for large ceremonies, ideal for outdoor standing receptions, and picture perfect for any over the top dinner with lighted redwoods and decadent food and wine pairings. This unforgettable space allows for festivities of any type and provides stunning views of the Napa River nature preserve or a spectacular evening under the Napa Valley stars. We offer the opportunity to buyout a private and exclusive onsite event center conveniently located adjacent to the hotel. The event center buyout offers intimate venues for 50-250 guests it is perfect Napa Valley location for a unique wedding experience. With over 3500 square feet of spectacular event space there are unlimited possibilities for your wedding and special event needs.